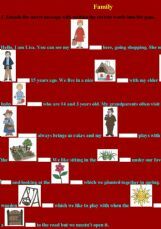 This is an exercise for practising family related words plus a little housing. You can learn the words by playing with pictures and a crossword. I hope you will have fun.